How much cheaper is Jet? The upstart beat the giant on 73% of overlapping products, according to a Boomerang Commerce study last fall. Jet discounts increase if you buy related items, as the service determines what products can be shipped from the same place, and if you select options like paying by debit card and declining the right to return. Jet is typically around 5% cheaper than Amazon, founder Marc Lore told Recode. I quit Prime after realizing I could get most items cheaper on Jet, and that I didn’t really need Prime’s other features. Having to spend $35 to get free shipping didn’t deter me, since it’s easy to hit that limit when you can buy groceries too. The lack of reviews is annoying, but it’s easy enough to look up reviews on Amazon and then buy on Jet. The smaller selection of products isn’t the end of the world, as Jet has most things I need, and I can always go over to Amazon when it doesn’t. As for the lack of streaming content, I don’t love Amazon Prime video enough to pay for it — not when I already have Netflix with my eye on HBO — and I don’t use Amazon Cloud Drive, not when I’m already paying Apple and Google for cloud storage. It is meant to be a tale of how Amazon Prime could eventually lose against Jet.com, with the latter often being cheaper. Given how journalists work, this is rather illuminating. The story here is “people might and will switch”. Once assigned to this or getting this approved, you start looking for facts and arguments to support this conclusion. The only thing they could come up with is price (and everything else not being good enough). At best, Jet.com will establish itself as a firm number two for all those who are very price-sensitive for different reasons. As studies have shown, while half of all U.S. households are Prime subscribers Amazon Prime is also preferred by high income earners. So in conclusion, the more lucrative half of all of U.S. households may already be subscribed to Amazon Prime. So, a duopol of sorts like we have with Apple’s iOS and Google’s Android, where one gets the highish income earners (iOS/Prime) and the other gets the rest (Android/Jet.com), would be the best outcome for Jet.com. This means Amazon will have better margins and more room to do more stuff than just, you know, free shipping of inexpensive items. 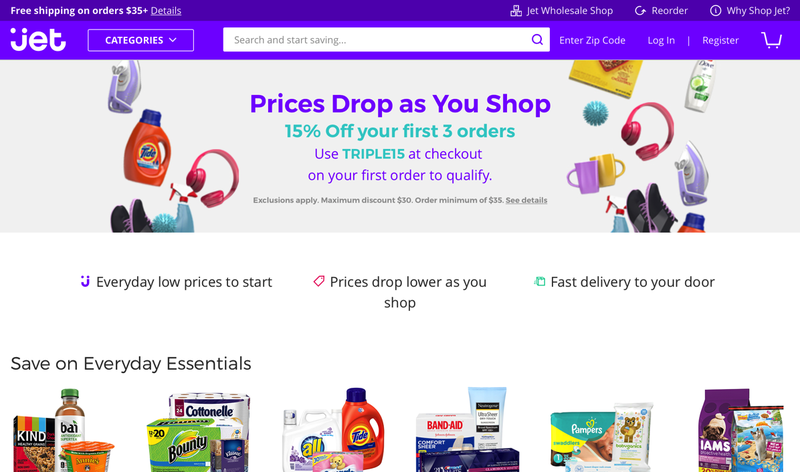 While Jet.com and Walmart are stuck with keeping the prices down. Now, keep in mind that this is the best case scenario. I don’t even believe this is very likely within the current constellation. This is because the bundle that is Amazon Prime creates asymmetric competition. Let’s stay with the price: Imagine a U.S. market where people stop paying for cable –not to hard to imagine given that every major cable TV company is losing subscribers-. People still would want to be entertained, they will still want to watch TV. So they turn to on-demand streaming. Netflix is far cheaper than cable. But you know what is even more inexpensive than cable or Netflix? Amazon Prime which comes with Prime Video. Amazon’s video streaming service needs to be good enough for this to work, sure. But looking at the bundle from this angle, arguing that price will make people switch to Jet.com becomes rather moot.